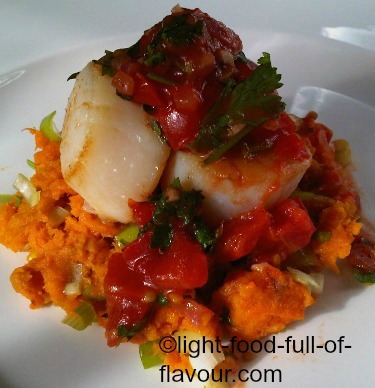 I think this dish is a showstopper – succulent large scallops with spicy mash (I use sweet potatoes for the mash) and a tomato salsa with attitude. And hooray, it’s good for you too! 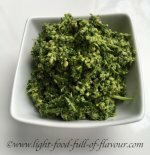 This is the way I like my food – massively tasty and healthy as well. Scallops are low in calories and rich in vitamins and zinc, a very important mineral which is needed - among other things - to make insulin and to boost the immune system. Apart from the tomato salsa, I serve these scallops with spicy mash with steamed tenderstem broccoli (broccolini) – which is super-healhty – and green beans. You can swap the sweet potatoes for pumpkin or butternut squash, or use a mixture of them. Talking about health and much vilified salt – I have started to use unrefined and mineral-rich Himalayan rose pink salt which according to many is the healthiest type of salt. It is a bit expensive, to be sure, but I find that I can use much less salt and still get the same result. It’s a winner to me. 1. Pre-heat the oven to 200C/fan180C/400F/gas mark 6. Place the diced sweet potato, oil and chilli flakes in an oven-proof dish and toss together. Season with some salt and pepper. Place the dish in the oven and cook for about 30 minutes – giving the potatoes a stir mid-way through – until soft. 2. While the sweet potatoes are in the oven, add 1 tablespoon olive oil to a sauce pan over a low heat. Add the onion, garlic and ginger to the pan and stir and cook for 5 minutes. Add the red wine vinegar and the tomatoes, season with some salt and pepper and increase the heat a little. Simmer for about 10 minutes. 3. Use a potato masher to roughly mash the sweet potatoes. Mix in the chopped spring onions (scallions). 4. Add some olive oil to a frying pan over a medium high heat. When the oil is hot, place the dried scallops in the pan, season with a pinch of salt and pepper and fry for about 45 seconds–1 minute on each side. Remove from the heat. 5. Add the chopped coriander (cilantro) to the salsa. Divide the mash between 4 plates, top with the scallops and a big dollop of tomato salsa. Serve immediately.